Preparation More or less 20 min. Peel shallots and cut into pieces. Sprinkle chicken livers with a bit of salt and flour. Heat oil in wok or frying pan and fry chicken livers for a short while. Add shallots, continue to stir fry and add beer. Season to taste with salt and pepper and allow to cool. Cut garlic salami into slices or roll up. Cut sun-dried tomatoes into slices. Arrange salad and leek shoots on plates and add chicken livers, sauce and tomatoes. Garnish with paprika. 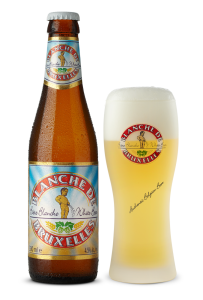 Serve with French loaf or ciabatta, accompanied by a nice cold glass of Blanche de Bruxelles.